Geodermatophilaceae (order Geodermatophilales, class Actinobacteria) form a comparatively isolated family within the phylum Actinobacteria and harbor many strains adapted to extreme ecological niches and tolerant against reactive oxygen species. Clarifying the evolutionary history of Geodermatophilaceae was so far mainly hampered by the insufficient resolution of the main phylogenetic marker in use, the 16S rRNA gene. In conjunction with the taxonomic characterisation of a motile and aerobic strain, designated YIM M13156T and phylogenetically located within the family, we here carried out a phylogenetic analysis of the genome sequences now available for the type strains of Geodermatophilaceae and re-analyzed the previously assembled phenotypic data. The results indicated that the largest genus, Geodermatophilus, is not monophyletic, hence the arrangement of the genera of Geodermatophilaceae must be reconsidered. Taxonomic markers such as polar lipids and fatty-acids profile, cellular features and temperature ranges are indeed heterogeneous within Geodermatophilus. In contrast to previous studies, we also address which of these features can be interpreted as apomorphies of which taxon, according to the principles of phylogenetic systematics. We thus propose a novel genus, Klenkia, with the type species Klenkia marina sp. nov. and harboring four species formerly assigned to Geodermatophilus, G. brasiliensis, G. soli, G. taihuensis, and G. terrae. Emended descriptions of all species of Geodermatophilaceae are provided for which type-strain genome sequences are publicly available. Our study again demonstrates that the principles of phylogenetic systematics can and should guide the interpretation of both genomic and phenotypic data. The order Geodermatophilales (Sen et al., 2014) comprises the sole family Geodermatophilaceae, which was initially proposed by Normand et al. (1996), although no type genus was designated at that time, confirmed later by Stackebrandt et al. (1997), formally described by Normand (2006) and later emended by Zhi et al. (2009). The family accommodates the genera Blastococcus (Ahrens and Moll, 1970; Skerman et al., 1980; Hezbri et al., 2016b), Modestobacter (Mevs et al., 2000) and the type genus Geodermatophilus (Luedemann, 1968; Skerman et al., 1980). Geodermatophilus was historically poorly studied due to difficulties in culturing novel isolates (Urzì et al., 2004). Overcoming those technical difficulties, the number of validly named species within the genus dramatically increased from a single species, G. obscurus, in 2011 to twenty-one species at the time of writing (Parte, 2014). The number of Geodermatophilus isolates is expected to continue to raise in coming years, as indicated by metagenomics studies carried out in arid and hyper-arid habitats (Neilson et al., 2012; Giongo et al., 2013). Species belonging to the genus are indeed mainly isolated from arid soils and characterized by tolerance against oxidative stress (Gtari et al., 2012; Montero-Calasanz et al., 2013a, 2014, 2015; Hezbri et al., 2015a, 2016a) although some isolates from rhizospheric soils and lake sediments have also been classified within the genus. In the post-genomic era, the integration of genomic information in microbial systematics (Klenk and Göker, 2010) in addition to physiological and chemotaxonomic parameters as taxonomic criteria is strongly suggested for classifying prokaryotes (Ramasamy et al., 2014). This particularly holds in groups such as Geodermatophilaceae, which are only incompletely resolved in phylogenies inferred from the most commonly applied marker gene, the 16S rRNA gene. Nevertheless, except for the genome sequences generated within our project only the genome (Ivanova et al., 2010) and proteome sequence of G. obscurus (Sghaier et al., 2016) were publicly available. Based on phylogenies inferred from genome-scale data and on a re-interpretation of the available phenotypic evidence according to the principles of phylogenetic systematics (Hennig, 1965; Wiley and Lieberman, 2011), this study introduces the new genus Klenkia into Geodermatophilaceae, whose type species is Klenkia marina sp. nov. Accordingly, we also propose the reclassification of G. brasiliensis as Klenkia brasiliensis comb. nov., G. soli as K. soli comb. nov., G. taihuensis as K. taihuensis comb. nov. and G. terrae as K. terrae comb. nov., as well as emended descriptions within Geodermatophilus. Strain YIM M13156T was isolated from a sample collected from the South China Sea (119° 31.949E, 18° 2.114 N), and was obtained using the serial dilution technique. Sediment sample (1 g) was added to 9 ml sterile distilled water and mixed by vortexing. A 10-fold dilution of this soil suspension was prepared in sterilized distilled water, and 0.1 ml was spread on Fucose-proline agar medium [fucose 5 g; proline 1 g; (NH4)2SO4 1 g; NaCl 1 g;CaCl2 2 g; K2HPO4 1 g; B-Vitamin trace (0.5 mg each of thiamine-HCl (B1), riboflavin, Niacin, pyridoxin, Ca-pantothenate, inositol, p-aminobenzoic acid, and 0.25 mg of biotin); sea salt 30 g; agar 20 g; pH 7.2; distilled water 1 liter]. The plate was then incubated at 28°C for 30 days. Morphological characteristics of strain YIM M13156T were determined on GYM Streptomyces medium at 28°C. Colony features were observed at 4 and 15 days under a stereo microscope according to Pelczar (1957). Exponentially growing bacterial cultures were observed with an optical microscope (Zeiss AxioScope A1) with a 1000-fold magnification and phase-contrast illumination. Gram reaction was performed using the KOH test described by Gregersen (1978). Oxidase activity was analyzed using filter-paper disks (Sartorius grade 388) impregnated with 1% solution of N,N,N′,N′-tetramethyl-p-phenylenediamine (Sigma–Aldrich); a positive test was defined by the development of a blue-purple color after applying biomass to the filter paper. Catalase activity was determined based on formation of bubbles following the addition of 1 drop of 3% H2O2. Growth rates were determined on plates of GYM Streptomyces medium for temperatures from 10°C to 50°C at 5°C increments and for pH values from 4.0 to 12.5 (in increments of 0.5 pH units) on modified ISP2 medium by adding NaOH or HCl, respectively, since the use of a buffer system inhibited growth of the strain. The oxidation of carbon compounds was tested at 28°C using GEN III Microplates in an Omnilog device (BIOLOG Inc., Hayward, CA, United States) in comparison with the reference strains G. brasiliensis DSM 44526T, G. soli DSM 45843T, G. taihuensis DSM 45962T, G. terrae DSM 45844T in parallel assays. The GEN III Microplates were inoculated with cells suspended in a viscous inoculating fluid (IF C) provided by the manufacturer at a cell density of 94% T for G. brasiliensis DSM 44526T, 83% T for G. soli DSM 45843T and G. terrae DSM 45844Tand 90% T for G. taihuensis DSM 45962T and for the strain YIM M13156T. Respiration rates were measured yielding a total running time of 5 days in Phenotype Microarray mode. Each strain was studied in two independent technical replicates. Data were exported and analyzed using the opm v.1.0.6 package (Vaas et al., 2012, 2013) for the R statistical environment (R Core Team, 2017). Reactions with a distinct behavior between the two replicates were regarded as ambiguous. Whole-cell amino acids and sugars were prepared according to Lechevalier and Lechevalier (1970), followed by thin-layer chromatography (TLC) analysis (Staneck and Roberts, 1974). Polar lipids were extracted, separated by two-dimensional TLC and identified according to procedures outlined by Minni et al. (1984) with modifications proposed by Kroppenstedt and Goodfellow (2006). For identification the presumed OH-PE spots were manually scraped off from unstained TLC plates, extracted with methanol and evaporated to dryness. The extracts were then dissolved in Reagent 3 (fatty acid extraction) and analyzed by MIDI System. Menaquinones (MK) were extracted from freeze-dried cell material using methanol as described by Collins (1985) and analyzed by high-performance liquid chromatography (HPLC) (Kroppenstedt, 1982). The extraction and analysis of cellular fatty acids was carried out in two independent repetitions from biomass grown on GYM agar plates held at 28°C for 4 days and harvested always from the same sector (the last quadrant streak). Analysis was conducted using the Microbial Identification System (MIDI) Sherlock Version 4.5 (method TSBA40, ACTIN6 database) as described by Sasser (1990). The annotation of the fatty acids in the ACTIN6 peak naming table is consistent with IUPAC nomenclature. Fatty-acid patterns were visualized as a heatmap using the lipid extension of the opm package (Vaas et al., 2013) and clustered using the pvclust v.1.2.2 package (Suzuki and Shimodaira, 2006) for the R statistical environment. Quantitative analysis of the fatty acids used logit-transformed percentages throughout (after setting zero values to the lowest non-zero number) because proportion data are expected to vary stronger around 50% than close to 0 or 100% (Crawley, 2007). All chemotaxonomic analyses were conducted under standardized conditions for strain YIM M13156T and the type strains listed above. Except for the separately stored MIDI measurements, all phenotypic characters were collected in a standardized tabular format that constitutes Supplementary Table S1. Custom scripts developed at DSMZ allow for extracting such data in ways suitable for subsequent phylogenetic or other analysis. For determining features specific for predetermined groups of interest, such as new taxa suggested by phylogenetic analysis, the randomForest function from the eponymous R package v. 4.6-12 (Breiman, 2001) was applied in classification mode under default settings except for increased values of ntree (50,000) and mtry (half the number of analyzed features). For 16S rRNA gene sequencing, genomic DNA extraction, PCR-mediated amplification of the 16S rRNA gene and purification of the PCR product was carried out as described by Rainey et al. (1996). For genome sequencing, the strain YIM M13156T and sixteen species with validly published Geodermatophilus names were cultivated in GYM Streptomyces broth at 28°C. The project information is available through the Genomes Online Database (Mukherjee et al., 2017). The draft genomes were generated at the DOE Joint Genome Institute (JGI) as part of Genomic Encyclopedia of Archaeal and Bacterial Type Strains, Phase II (KMG-II): from individual species to whole genera (Kyrpides et al., 2014) following the same protocol as in Nouioui et al. (2017). All genomes were annotated using the DOE-JGI annotation pipeline (Huntemann et al., 2015; Chen et al., 2016) and released through the Integrated Microbial Genomes system (Chen et al., 2017). Phylogenetic analysis of the 16S rRNA gene sequences from the type strains of all species with effectively published names in Geodermatophilaceae, as well as the genome-sequenced strains Cryptosporangium arvum DSM 44712T and Sporichthya polymorpha DSM 43042T for use as outgroup, was conducted as previously described (Göker et al., 2011; Montero-Calasanz et al., 2014b). Pairwise 16S rRNA gene similarities were calculated as recommended by Meier-Kolthoff et al. (2013b) to determine strains with ≥99.0% similarity, between which (digital) DNA:DNA hybridization experiments should be conducted. Genome-scale phylogenies were inferred from the available Geodermatophilaceae (and outgroup) whole proteome sequences using the high-throughput version (Meier-Kolthoff et al., 2014a) of the genome BLAST Distance Phylogeny (GBDP) approach (Auch et al., 2010) in conjunction with FastME (Lefort et al., 2015) as described earlier (Hahnke et al., 2016). An additional FastME tree was inferred without the two outgroup genomes to detect potential long-branch attraction to the outgroup, a process called long-branch extraction (Siddall and Whiting, 1999). Additionally, the validity of the rooting was tested by re-estimating the root (Simon et al., 2017) using least-squares dating (To et al., 2015). The GBDP tree restricted to the well-supported branches (≥95% pseudo-bootstrap support) was used as a backbone constraint in a further 16S rRNA gene analysis to integrate information from genome-scale data (Hahnke et al., 2016). Digital DNA:DNA hybridisations were conducted using the recommended settings of the Genome-To-Genome Distance Calculator (GGDC) version 2.1 (Meier-Kolthoff et al., 2013a). The G+C content was calculated from the genome sequences as described by Meier-Kolthoff et al. (2014b). The phylogenetic tree based on the whole proteomes of the sequenced type strains placed, with maximum support, the group formed by the strain YIM M13156T, G. brasiliensis DSM 44526T, G. soli DSM 45843T and G. taihuensis DSM 45962T as a sister-group of all other Geodermatophilaceae genera (Figure 1). Hence Geodermatophilus is obviously non-monophyletic according to this tree, as Modestobacter as well as Blastococcus appeared as more closely related to core Geodermatophilus (including the type species G. obscurus) than the four deviating Geodermatophilus strains. When C. arvum and S. polymorpha were removed, the resulting unrooted topologically was identical to the (unrooted) ingroup topology shown in Figure 1. That is, it was impossible to root the reduced tree in a way that made Geodermatophilus monophyletic, indicating that the non-monophyly of Geodermatophilus was not caused by a long-branch attraction artifact. Least-squares dating confirmed the rooting in both the full and the reduced tree. 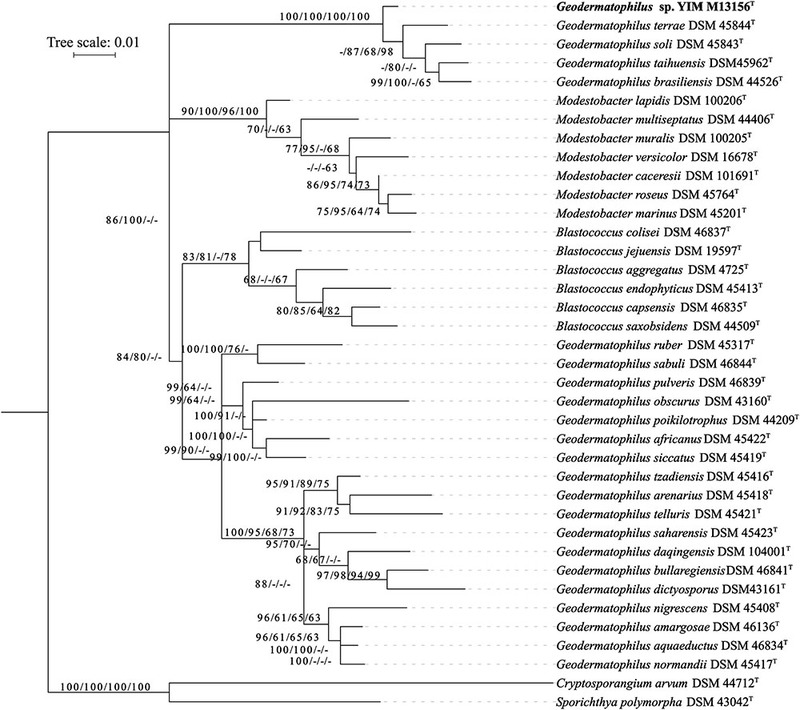 As expected, the unconstrained phylogenetic tree based on 16S rRNA gene sequences was not well resolved at its backbone but when applying the constraint derived from the GBDP tree, Modestobacter, Blastoccocus and the two distinct groups of Geodermatophilus appeared as monophyletic (Figure 2); support for their monophyly was strong except in the case of Blastococcus. Moderate to strong support was obtained for Modestobacter and Blastoccocus being more closely related to core Geodermatophilus than the group formed by the strain YIM M13156T as well as the species G. brasiliensis, G. soli, G. taihuensis and G. terrae. FIGURE 1. Phylogenomic tree inferred with GBDP. The tree was inferred with FastME from GBDP distances calculated from whole proteomes. The numbers above branches are GBDP pseudo-bootstrap support values from 100 replications. Tip colors indicate chemotaxonomic characters that provide apomorphies for groups of interest, genome sizes and the exact G+C content as calculated from the genome sequences (see the embedded legend for details). B., Blastococcus; C., Cryptosporangium; G., Geodermatophilus; M., Modestobacter; S., Sporichthya; NA, not applicable. FIGURE 2. Maximum likelihood phylogenetic tree inferred from 16S rRNA gene sequences, showing the phylogenetic position of the strain YIM M13156T relative to the type strains within Geodermatophilaceae. The branches are scaled in terms of the expected number of substitutions per site (see size bar). Support values from maximum-likelihood constrained (first), maximum-parsimony constrained (second), maximum-likelihood unconstrained (third) and maximum-parsimony unconstrained (fourth) bootstrapping are shown above the branches if equal to or larger than 60%. Within this clade, the 16S rRNA gene sequence of strain YIM M13156T showed similarities ≥ 99.0% with the type strains of G. soli (99.1%) and G. brasiliensis (99.0%) only; those with G. terrae (98.9%) and G. taihuensis (98.0%) were lower. Digital DNA:DNA hybridisations between strain YIM M13156T and G. soli DSM 45843T and G. brasiliensis DSM 44526T resulted in 29.8 and 29.6% similarity, respectively, clearly below the 70% threshold recommended by Wayne et al. (1987) to confirm the species status of novel strains. Additional digital DNA:DNA hybridisations were not conducted, based on the observation of Meier-Kolthoff et al. (2013b) that an Actinobacteria-specific 16S rRNA threshold of 99.0% yielded a maximum probability of error of only 1% to obtain DNA:DNA hybridization values ≥ 70%. The genome size range found in the sequenced type strains varied between 4.2 Mbp for the strain YIM M13156T and 5.9 Mbp for G. amargosae DSM 46136T (Figure 1). The genomic G+C content of strain YIM M13156T was 74.4%. For the other genomes it ranged between 74.0% for G. obscurus, G. ruber and G. sabuli and 75.9% for G. nigrescens (Figure 1). Because G+C content values do not differ more than 1% within bacterial species (Meier-Kolthoff et al., 2014b), stronger deviations are due to artifacts in conventionally determined G+C content values. Hence, we accordingly propose to emend the species descriptions of those species for which we observed a deviation from published G+C content values > 1%. Strain YIM M13156T showed motile, rod-shaped and Gram-positive cells. These observations are in line with those described by Jin et al. (2013), Qu et al. (2013), and Bertazzo et al. (2014) for G. soli and G. terrae, G. taihuensis, and G. brasiliensis, respectively. In contrast to these four species, neither high aggregates forming multilocular sporangia nor zoospores were identified in YIM M13156T cultures (Supplementary Table S1). Colonies were pink-colored, convex, circular and opaque with a smooth surface and an entire margin, an appearance similar to other Geodermatophilus species when cultivated under the same growth conditions. Cell growth ranged from 20 to 35°C (optimal growth temperature 25–30°C) and from pH 6.0 to 8.5 (optimal pH 6.5–8.0). Results from phenotype microarray analysis are shown as a heatmap in the Supplementary Material (Supplementary Figure S1) in comparison to the type strains of the four most closely related species. Differences between species were much more pronounced than between replicates. A summary of selected phenotypic characteristics is presented in Table 1 (for an overview of phenotypic profiles in Geodermatophilus see Supplementary Table S1). TABLE 1. Phenotypic characteristics of strain YIM M13156T in comparison to those of the type strains of the most closely related Geodermatophilus species. The randomForest analysis indicated that among the previously mentioned phenotypic features the cell shape well discriminates between the group formed by strain YIM M13156T, G. brasiliensis, G. soli, G. taihuensis and G. terrae, which produce rods, on the one hand and core Geodermatophilus, which is characterized by pleomorphic cells (and seldom cocci), on the other hand (Supplementary Figure S2). Analysis of whole-cell components revealed the presence of meso-diaminopimelic acid (Cell-wall type III), which is consistent with the other representatives of Geodermatophilaceae (Normand and Benson, 2012). Strain YIM M13156T displayed primarily menaquinone MK-9(H4) (52.7%), in agreement with values reported for Geodermatophilaceae (Normand, 2006), and MK-9(H0) (39.2%). The presence of a significant amount of MK-9(H0) was already mentioned in the original descriptions of G. brasiliensis, G. soli, G. taihuensis, and G. terrae, but also in other Geodermatophilus species (Montero-Calasanz et al., 2015). In contrast to the already described profiles of isoprenologs of G. soli, G. taihuensis and G. terrae, traces of MK-9(H2) (6.6, 1.5, and 2.8%, respectively) were now additionally identified in those type strains. MK-8(H4) (5.7%) and MK-10(H4) (3.4%) were also detected in the patterns of G. taihuensis DSM 45962T and G. terrae DSM 45844T, respectively. The polar lipid pattern of strain YIM M13156T consisted of diphosphatidylglycerol (DPG), phosphatidylethanolamine (PE), phosphatidylinositol (PI), glycophosphatidylinositol (GPI), an unidentified aminolipid (AL) and traces of hydroxyphosphatidylethanolamine (OH-PE) (Figure 3a). It is in accordance with patterns obtained for the closely related species investigated in this study (Figures 3b–d) and the phospholipid pattern revealed by Bertazzo et al. (2014) for G. brasiliensis. The randomForest analysis detected the lack of phosphatidylcholine and the presence of glycophosphatidylinositol as excellently predictive of the prospective new genus, whereas the absence of phosphatidylglycerol was also observed in other Geodermatophilus species (Bertazzo et al., 2014; Montero-Calasanz et al., 2014b, 2015; Hezbri et al., 2015a,b,c, 2016a). The unambiguous presence of hydroxyphosphatidylethanolamine is a slightly less relevant taxonomic marker for the prospective new genus; among core Geodermatophilus it was only detected in the polar lipid profile of G. pulveris DSM 45839T by Hezbri et al. (2016a). FIGURE 3. Polar lipids profile of strain YIM M13156T (a), G. soli DSM 45843T (b), G. taihuensis DSM 45962T (c) and G. terrae DSM 45844T (d) after separation by two-dimensional TLC using the solvents chloroform:methanol:water (65:25:4; v:v:v) in the first dimension and chloroform:methanol:acetic acid:water (80:12:15:4; v:v:v:v) in the second one. 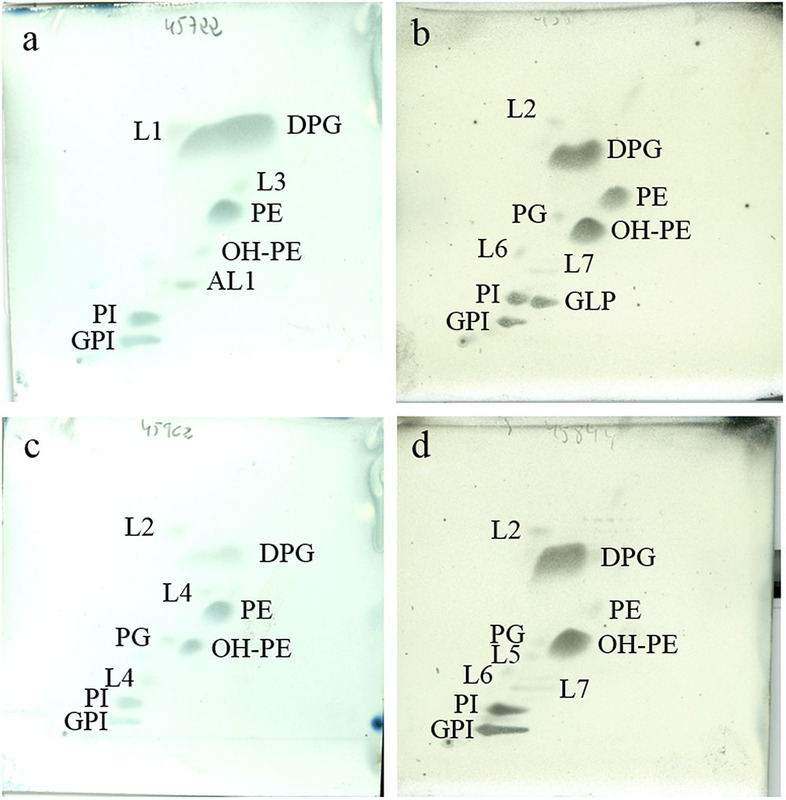 Plates were sprayed with molybdatophosphoric acid (3.5%; MerckTM) for detection of the total polar lipids. DPG, diphosphatidylglycerol; PG, phosphatidylglycerol; PE, phosphatidylethanolamine; OH-PE, hydroxyphosphatidylethanolamine; PI, phosphatidylinositol; GPI, glycophosphatidylinositol; GPL, unidentified glycophospholipid; AL, aminolipid; L1-7, unidentified lipids. All data are from this study. Even though both absence of phosphatidylcholine and presence of glycophosphatidylinositol were also observed in the polar-lipid profiles of some Modestobacter species (Montero-Calasanz et al., in preparation), the additional presence of hydroxyphosphatidylethanolamine forms a unique pattern of strain YIM M13156T and its four most closely related species. In addition, based on our results and the chromatographic mobility of the polar lipid labeled as phosphatidylmethylethanolamine in the original descriptions of G. soli and G. terrae by Jin et al. (2013), it is strongly suggested that it was not correctly identified in the original work, since after binding a methyl-group to phosphatidylethanolamine the resultant component would show a higher apolarity and therefore a higher mobility on the plate than phosphatidylethanolamine itself. Hydroxyphosphatidylethanolamine is not known from the outgroup species Cryptosporangium arvum (Tamura et al., 1998). Major fatty acids were the saturated branched-chain iso-C16:0 (36.8 ± 1.1%), the monounsaturated C17:1ω8c (13.4 ± 0.4%) and the saturated branched-chain iso-C15:0 (11.5 ± 0.5%) complemented by iso-C16:1 H (5.0 ± 0.4%), C17:0 (4.5 ± 0.3%) and C18:19ωc (5.0 ± 0.2%) in agreement with the closest related species (Table 1; for an overview of fatty-acid profiles in Geodermatophilus see Supplementary Table S2). In addition, the occurrence of 2-hydroxy fatty acids (mainly iso-C17:0 2OH) is also worth mentioning as it supports the presence of OH-PE observed in the polar lipids profiles of strain YIM M13156T and its four most closely related species (for an overview of fatty-acids profiles in Geodermatophilus see Supplementary Table S2). The 2-hydroxy fatty acids are a pre-requisite for the synthesis of the hydroxylated polar lipid (Kämpfer et al., 2010). The clustering analysis of the logit-transformed fatty-acid profiles revealed that those of YIM M13156T, G. brasiliensis, G. soli, G. taihuensis, and G. terrae separated first. Hence the profiles of the other Geodermatophilus species were more similar to the ones of Blastococcus and Modestobacter (Figure 4). Accordingly, the randomForest analysis identified three minor components (iso-C17:0 10-methyl, C17:0 3OH and iso-C16:0 10-methyl) highly predictive of the group formed by strain YIM M13156T, G. brasiliensis, G. soli, G. taihuensis, and G. terrae. The fatty-acid profiles thus even independently supported the assignment of these five species to a new genus (Supplementary Figures S3, S4). FIGURE 4. Fatty-acids dendrogram estimated from the logit-transformed percent values as measured with the MIDI system using the Ward algorithm for agglomerative hierarchical clustering and euclidean distances using the pvclust package for the R statistical environment. Approximately unbiased (AU, left) and bootstrapping (BP, right) support values are shown above the branches. Whole-cell sugar analysis revealed rhamnose, ribose, mannose, glucose and an unidentified sugar showing a similar chromatographic mobility than the unidentified sugar found in G. normandii DSM 45417T by Montero-Calasanz et al. (2013b). On the other hand, G. soli DSM 45843T, G. taihuensis DSM 45962T and G. terrae DSM 45844T showed the same sugar profile as G. brasiliensis DSM 45426T (Bertazzo et al., 2014), consisting of ribose, mannose, glucose and galactose (Lechevalier and Lechevalier, 1970). The absence of galactose in the profile of strain YIM M13156T might differentiate this species from others within the group. In order to standardize the phenotypic data available for the genus Geodermatophilus, analyses of polar lipids, whole-cell sugars and menaquinones were also carried out for the species G. obscurus DSM 43160T, G. ruber DSM 45317T and G. nigrescens DSM 45408T. The polar lipid and menaquinone profiles of those species were already specified in the Table 1 of the original description of G. arenarius DSM 45418T by Montero-Calasanz et al. (2012), nevertheless they were never properly described nor the species emended. The three species showed the typical polar-lipid profile observed in Geodermatophilus consisting of diphosphatidylglycerol (DPG), phosphatidylethanolamine (PE), phosphatidylcholine (PC), phosphatidylinositol (PI) and minor amounts of phosphatidylglycerol (PG) (see Supplementary Figure S5). Similar to the group formed by G. brasiliensis DSM 44526T, G. soli DSM 45843T, G. taihuensis DSM 45962T and G. terrae DSM 45844T, G. ruber DSM 45317T displayed glycophosphatidylinositol (GPI) in addition to an unidentified phospholipid (PL). The polar-lipid profiles of G. obscurus DSM 43160T and G. nigrescens DSM 45408T conversely revealed the typical unidentified glycolipid already described for most Geodermatophilus species (See supplementary Table S1). Regarding the MK pattern of G. obscurus DSM 43160T, apart from MK-9(H4) (64.3%) already indicated by Zhang et al. (2011), MK-9(H2) (8.7%), MK-9(H0) (4.9%) and MK-8(H4) (4.3%) were also revealed. Nevertheless, in contrast to Zhang et al. (2011) and in addition to MK-9(H4), our studies did not identify MK-9(H0) in the profile of G. ruber DSM 45317T. The whole-cell sugar patterns of G. obscurus DSM 43160T revealed the presence of ribose, xylose, mannose, glucose and galactose. G. ruber DSM 45317T displayed a profile consisting of ribose and glucose. Differently from Nie et al. (2012) who identified galactose, arabinose and glucosamine as the whole-cell sugar patters of G. nigrescens DSM 45408T, our results showed a profile comprising mannose, glucose, galactose and traces of rhamnose and ribose. These profiles are consistent with those previously described in the genus, although it is worth mentioning the absence of galactose in the profiles of G. ruber DSM 45317T, a feature shared, as mentioned previously, with the strain YIM M13156T. The presence of xylose was already described for G. saharensis DSM 45423T (Montero-Calasanz et al., 2013c). Phylogenetic analysis based on whole genome and 16S rRNA gene sequences revealed with strong support that strain YIM M13156T and the species G. brasiliensis DSM 44526T, G. soli DSM 45843T, G. taihuensis DSM 45962T and G. terrae DSM 45844T formed a separate lineage within Geodermatophilaceae, hence Geodermatophilus is not monophyletic. Since the main goal of phylogenetic systematics is to obtain monophyletic taxa (Hennig, 1965; Wiley and Lieberman, 2011) taxonomic consequences are necessary. A lumping approach would require merging all Geodermatophilaceae genera into Geodermatophilus, which has priority, and thus the generation of 13 new names (i.e., new combinations for Blastococcus and Modestobacter). In contrast, placing the aberrant Geodermatophilus species into a separate genus require the generation of only four new names, one for the new genus and four new combinations. Taxonomic conservatism, most easily be measured as inversely proportional to the number of new names to be created (Breider et al., 2014), thus clearly favors the splitting solution. These two arguments alone justify the need to introduce a new genus of Geodermatophilaceae. Nevertheless, the phenotype also provided rich information on the interrelationships of the envisaged new genus. Strain YIM M13156T and its four neighboring species were distinguished from other genera in the family Geodermatophilaceae by cell morphology, the lack of spores, the absence of phosphatidylcholine and the typical unidentified glycolipid found ins Geodermatophilus, the presence of glycophosphatidylinositol and hydroxyphosphatidylethanolamine in their polar lipids profiles (for an overview of the characteristics that differentiate the strain YIM M13156T, G. brasiliensis, G. soli, G. taihuensis and G. terrae from closely related Geodermatophilaceae genera see Supplementary Table S1 and randomForest predictions Supplementary Figure S2) and the occurrence of iso-C17:0 2OH and other minor compounds (Supplementary Figure S4 and Supplementary Table S2) in their fatty-acids patterns. However, in phylogenetic systematics diagnostic features for a group are insufficient to establish it as a taxon because when these features were plesiomorphic (ancestral) instead of apomorphic (derived) then they could well diagnose a paraphyletic group (Hennig, 1965; Wiley and Lieberman, 2011); reptiles are a classical example. For this reason, we studied the distribution of the above listed features among Geodermatophilaceae and the outgroup species Cryptosporangium arvum (Tamura et al., 1998) and Sporichthya polymorpha (Supplementary Figure S4 and Supplementary Table S2) for determining with maximum-parsimony reconstructions which character state was apomorphic for which group (Figure 1). Accordingly, presence of hydroxyphosphatidylethanolamine, iso-C17:0 10-methyl, C17:0 3OH and iso-C16:0 10-methyl appeared as synapomorphies of YIM M13156T and its four neighboring species; presence of glycophosphatidylinositol appeared as autapomorphy of Geodermatophilaceae; secondary absence of glycophosphatidylinositol and presence of phosphatidylcholine as synapomorphy of core Geodermatophilus and Blastococcus; and presence of the unidentified glycolipid as autopomorphies of core Geodermatophilus. Hydroxyphosphatidylethanolamine is present in G. pulveris, too, but was gained independently; the unidentified glycolipid is missing in G. ruber but was secondarily lost (Figure 1). The status of cell morphology and spore formation was unclear due to missing data (Supplementary Table S1) but the already assembled evidence clearly supports the envisaged reclassification. The currently still dominating practice of polyphasic taxonomy (Vandamme et al., 1996) in microbial systematics has increasingly been called into question in recent years (Sutcliffe et al., 2012; Vandamme and Peeters, 2014; Sutcliffe, 2015; Thompson et al., 2015). Critics mainly emphasize that more genomic information should be incorporated and that some of the nowadays routinely conducted phenotypic tests might actually be unnecessary. It was also obvious in the present study that genome-scale data yielded high resolution (Figure 1), which via a backbone constraint (Hahnke et al., 2016) could also inform a more comprehensively sampled 16S rRNA gene analysis (Figure 2). Whereas phylogenomics is expected to yield more strongly resolved trees, these might in theory also yield more conflict between distinct analyses (Jeffroy et al., 2006; Klenk and Göker, 2010). Horizontal gene transfer is a known cause of topological conflict between analyses of single genes that has even been be used to argue against hierarchical classification (Bapteste and Boucher, 2009; Klenk and Göker, 2010). However, the increase of support in phylogenomic analyses after adding genes up to virtually all available genes indicates a strong hierarchical signal (Breider et al., 2014), whereas the selection of pre-defined set of few genes does not yield genome-scale data and relies on a priori assumptions about the relative suitability of genes for analysis (Lienau and DeSalle, 2009; Klenk and Göker, 2010). Methods such as GBDP, which infer trees rather directly from complete genomes, are more promising for obtaining a truly genome-based classification, but conflict between single genes raises the question of how to not overestimate phylogenetic confidence (Taylor and Piel, 2004). This issue can hardly be overestimated because in phylogenetic systematics taxa must be as well supported as monophyletic as possible (Vences et al., 2013), which rules out all phylogenomic methods that do not even yield statistical support values. Instead of standard bootstrapping, the partition bootstrap, which resamples entire genes, is supposed to reduce conflict and provide more reliable support values (Siddall, 2010; Simon et al., 2017). Within the GBDP pseudo-bootstrapping framework, the greedy-with-trimming algorithm (Meier-Kolthoff et al., 2014a) as applied in the present study is the equivalent of the partition bootstrap (Hahnke et al., 2016). Properly analyzed genome-scale data thus address the current shortcoming of polyphasic taxonomy that its starting point is an often poorly resolved 16S rRNA gene tree. After choosing taxon boundaries from such a tree, the polyphasic approach would then proceed with determining diagnostic features for the new taxa. Tools such as randomForest as used here can assist in the task to select features predictive for a certain group of interest from larger numbers of characters. However, a more serious problem with the currently dominating polyphasic approach is that such diagnostic features cannot provide independent evidence for taxon boundaries when these boundaries were already used to choose the features. Independent evidence can instead be obtained by detecting the same groups independently when analyzing the additional features (Figure 3). Moreover, in phylogenetic systematics diagnostic features are insufficient for justifying a taxon because taxa must be monophyletic, whereas diagnostic character states can be plesiomorphic and thus diagnose a paraphyletic group (Hennig, 1965; Wiley and Lieberman, 2011). To the best of our knowledge, publications applying polyphasic taxonomy hardly ever address these two issues, even though phylogenetic systematics is the appropriate paradigm for microbial taxonomy, too (Klenk and Göker, 2010). Outgroup and ingroup comparisons might sometimes be difficult because of incomplete character sampling but in the present study succeeded in determining that some character states were apomorphies for the envisaged new taxa. We thus believe that microbial taxonomy would not only benefit from incorporating genomic information but also from adhering to the principles of phylogenetic systematics. Based on phenotypic and genotypic data presented, we propose that strain YIM M13156T represents a novel species of a new genus of Geodermatophilaceae, for which the name Klenkia marina gen. nov., sp. nov. is proposed. In addition we propose the reclassification of Geodermatophilus brasiliensis as Klenkia brasiliensis comb. nov., Geodermatophilus soli as Klenkia soli comb. nov., Geodermatophilus taihuensis as Klenkia taihuensis comb. nov. and Geodermatophilus terrae as Klenkia terrae comb. nov. The emendation of the genus Geodermatophilus and the species G. africanus, G. amargosae, G. aquaeductus, G. dictyosporus, G. nigrescens, G. normandii, G. obscurus, G. poikilotrophus, G. pulveris, G. ruber, G. sabuli, G. saharensis, G. siccatus, and G. telluris are also proposed in this study. Description of Klenkia gen. nov.
Klen’ki.a (N. L. fem. n. Klenkia, named in honor of Hans-Peter Klenk, Professor at Newcastle University (United Kingdom) in recognition of his contributions to bacterial systematics including the promotion of studies in Geodermatophilaceae). Cells are motile, rod-shaped and Gram-reaction-positive. The peptidoglycan in the cell-wall contains meso-diaminopimelic acid. The predominant menaquinones are MK-9(H4) and MK-9(H0) but MK-9(H2), MK-8(H4) and MK-10(H4) may also be present in minor amounts. The basic polar-lipids profile includes diphosphatidylglycerol, phosphatidylethanolamine, hydroxyphosphatidylethanolamine, phosphatidylinositol and glycophosphoinositol. In some species an unidentified glycophospholipid may be present. Phosphatidylcholine is absent. Major cellular fatty acids are iso-C16:0 and iso-C15:0. The basic whole-cell sugar pattern includes ribose, mannose and glucose. The presence of galactose is frequent. Rhamnose may occur in some species. The genomic G+C content is 74.0–75.0%. The type species of Klenkia is Klenkia marina, sp. nov. Description of Klenkia marina sp. nov.
K. ma.ri’na. (L. fem. adj. marina, of the sea, marine). Colonies are pink-colored, convex, circular and opaque with a smooth surface and an entire margin. Cells are motile, rod-shaped and Gram-reaction-positive. According to the BIOLOG System: dextrin, D-maltose, D-trehalose, D-cellobiose, sucrose, turanose, β-methyl-D-glucoside, N-acetyl-D-glucosamine, D-glucose, D-mannose, D-fructose, D-galactose, inosine,D-mannitol, glycerol, L-alanine, L-glutamic acid, L-pyroglutamic acid, pectin, methyl pyruvate, citric acid, α-keto-glutaric acid, D-malic acid, L-malic acid, bromo-succinic acid, nalidixic acid, lithium chloride, potassium tellurite, α-hydroxy-butyric acid, β-hydroxy-butyric acid, α-keto-butyric acid, acetoacetic acid, propionic acid, acetic acid and aztreonam are positive but stachyose, D-raffinose, alpha-D-lactose, D-melibiose, N-acetyl-D-galactosamine, N-acetyl-neuraminic acid, 3-O-methyl-D-glucose, D-fucose, L-fucose, L-rhamnose, fusidic acid, D-sorbitol, D-arabitol, D-fructose-6-phosphate, D-aspartic acid, D-serine, troleandomycin, rifamycin SV, minocycline, gelatin, L-arginine, L-aspartic acid, L-histidine, lincomycin, guanidinehydrochloride, niaproof, D-galacturonic acid, L-galactonic acid-γ-lactone, D-glucuronic acid, glucuronamide, mucic acid, quinic acid, D-saccharic acid, vancomycin, tetrazolium violet, tetrazolium blue, p-hydroxy-phenylacetic acid, L-lactic acid, tween 40, γ-amino-n-butyric acid, sodium formate and butyric acid are negative. Cell growth ranges from 20 to 30°C (optimal growth temperature is 25–30°C), from pH 6.0–8.5 (optimal range 6.5–8.0) and 0–4% NaCl. The peptidoglycan in the cell-wall contains meso-diaminopimelic acid as diamino acid. The whole-cell sugars are rhamnose, ribose, mannose, glucose and an unidentified sugar. The predominant menaquinones are MK-9(H4) and MK-9(H0). The main polar lipids are diphosphatidylglycerol, phosphatidylethanolamine, phosphatidylinositol, glycophosphatidylinositol, an unidentified aminolipid and traces of hydroxyphosphatidylethanolamine. Cellular fatty acids consist mainly of iso-C16:0, C17:1ω9 and iso-C15:0. The type strain has a genomic G+C content of 74.4%. The genome size is 4.2 Mbp. The INSDC accession number for the 16S rRNA gene sequences of the type strain YIM M13156T (=DSM 45722T = CCTCC AB 2012057T) is LT746188. The accession number for the whole genome sequence of strain YIM M13156T is FMUH01000001. Description of Klenkia brasiliensis comb. nov.
K. bra.si.li.en’sis. (N. L. fem. adj. brasiliensis, referring to Brazil, the country from where the type strain was isolated). The description is as given by Bertazzo et al. (2014) with the following modification. The genomic G+C content is 74.8%. The genome size is 4.5 Mbp. The accession number for the whole genome sequence of strain DSM 44526T is FNCF00000000. The type strain Tü 6233T (= DSM 44526T = CECT 8402T) was isolated from soil collected in São José do Rio Preto, São Paulo (20°46′39′′ S, 49°21′35′′ W, altitude 530 m above mean see level), Brazil. Description of Klenkia soli comb. nov. The properties are as given in the species description by Jin et al. (2013) with the following emendation. In addition to diphosphatidylglycerol, phosphatidylethanolamine and phosphatidylinositol, the polar lipids pattern consists in phosphatidylglycerol, hydroxyphosphatidylethanolamine, an unidentified glycophospholipid and glycophosphatidylinositol (the chromatographic mobility of which is documented in Fig. 1b). Phosphatidylcholine and phosphatidylmethylethanolamine are absent. The whole-cell sugars are ribose, mannose, glucose and galactose. MK-9(H4) is the predominant menaquinone but also contains MK-9(H0) (as listed by Jin et al., 2013) and MK-9(H2). The genomic G+C content is 74.2%. The genome size is 4.8 Mbp. The accession number for the whole genome sequence of strain DSM 45843T is FNIR00000000. The type strain, PB34T (=DSM 45843T = KCTC 19880T = JCM 17785T), was isolated from grass soil in Korea. Description of Klenkia taihuensis comb. nov.
K. tai.hu.en’sis. (N. L. fem. adj. taihuensis, of or pertaining to Taihu Lake, the source of the sediment from which the type strain was isolated). The properties are as given in the species description by Qu et al. (2013) with the following emendation. In addition to diphosphatidylglycerol, phosphatidylethanolamine and phosphatidylinositol, the polar lipids pattern consists of phosphatidylglycerol, hydroxyphosphatitylethanolamine and glycophosphatidylinositol (the chromatographic mobility of which is documented in Figure 1C). Phosphatidylcholine is absent. The whole-cell sugars are ribose, mannose, glucose and galactose. Meso-diaminopimelic acid is present. MK-9(H4) is the predominant menaquinone but the strain also contains MK-9(H0), MK-9(H6) (as listed by Qu et al., 2013), MK-9(H2) and MK-8(H4). The genomic G+C content is 74.9%. The genome size is 4.3 Mbp. The accession number for the whole genome sequence of strain DSM 45962T is FOMD00000000. The type strain is 3-wff-81T (=DSM 45962T = CGMCC 1.12303T = NBRC 109416T), isolated from the superficial sediment of Taihu Lake in Jiangsu Province, China. Description of Klenkia terrae comb. nov.
K. ter’ra.e. (L. gen. n. terrae, of the earth). The properties are as given in the species description by Jin et al. (2013) with the following emendation. In addition to diphosphatidylglycerol, phosphatidylethanolamine and phosphatidylinositol, the polar lipids pattern consists in phosphatidylglycerol, hydroxyphosphatitylethanolamine and glycophosphatidylinositol (the chromatographic mobility of which is documented in Figure 1D). Phosphatidylcholine and phosphatidylmethylethanolamine are absent. The whole-cell sugars are ribose, mannose, glucose and galactose. MK-9(H4) is the predominant menaquinone but also contains MK-9(H0) (as listed by Jin et al., 2013), MK-9(H2) and MK-10(H4). The type strain, PB261T (=DSM 45844T = KCTC 19881T = JCM 17786T), was isolated from grass soil in Korea. The properties are as given by Luedemann (1968) with the following modifications. The peptidoglycan in the whole-cell contains meso-diaminopimelic acid. The predominant menaquinone is MK-9(H4) but MK-9(H0), MK-9(H2), MK-9(H6), MK-8(H4) and MK-10(H4) may also be present in significant or minor amounts. The basic polar lipids profile involves diphosphatidylglycerol, phosphatidylethanolamine, phosphatidylcholine, phosphatidylinositol and an unidentified glycolipid. The presence of phosphatidylglycerol is frequent. Major cellular fatty acids are iso-C16:0 and iso-C15:0. The whole-cell sugar pattern frequently includes ribose, mannose, glucose and galactose as diagnostic sugar. The genomic G+C content is 74.0–76.0%. The properties are as given in the species description by Montero-Calasanz et al. (2013e) with the following modification. The genomic G+C content is 74.3%. The genome size is 5.5 Mbp. The accession number for the whole genome sequences of the type strain DSM 45422T is FNOT00000000. The properties are as given in the species description by Montero-Calasanz et al. (2014b) with the following modification. The genomic G+C content is 74.2%. The genome size is 5.9 Mbp. The accession number for the whole genome sequence of the type strain DSM 46136T is FPBA00000000. The properties are as given in the species description by Hezbri et al. (2015c) with the following modification. The genomic G+C content is 75.0%. The genome size is 5.4 Mbp. The ENA accession numbers for the whole genome sequence of the type strain DSM 46834T are FXTJ01000001-FXTJ01000028. The properties are as given in the species description by Montero-Calasanz et al. (2015) with the following modification. The DNA G+C content is 75.3% (genome sequence). The genome size is 5.0 Mbp. The ENA accession numbers for the whole genome sequence of the type strain DSM 43161T are FOWE01000001-FOWE01000022. The properties are as given in the species description by Nie et al. (2012) with the following emendation. It grows well on GYM and GPHF media but poor on TSA and not on R2A, GEO, Luedemann and PYGV media. The following enzymatic activities according to API ZYM strips are present: alkaline phosphatase, esterase lipase, leucine arylamidase, valine arylamidase and α-glucosidase. In addition to diphosphati dylglycerol, phosphatidylglycerol, phosphatidylethanolamine and phosphatidylcholine the polar lipids profile contains phosphatidylinositol and two unidentified glycolipids (the chromatographic mobility of which is documented in Supplementary Figure S5A). The whole-cell sugars are mannose, glucose, galactose and traces of rhamnose and ribose. Arabinose and glucosamine as listed by Nie et al. (2012) are absent. The genomic G+C content is 75.9%. The genome size is 4.7 Mbp. The accession number for the whole genome sequences of strain DSM 45408T is FQVX00000000. The properties are as given in the species description by Montero-Calasanz et al. (2013b) with the following modification. The DNA G+C content is 75.3% (genome sequence). The genome size is 4.6 Mbp. The IMG accession number for the whole genome sequence of the type strain DSM 45417T is 2585427554. The properties are as given in the species description by Luedemann (1968) with the following emendation. The temperature range is from 15.0°C to 40.0 with an optimum range from 28°C to 37°C. pH range is 6.0–9.0 (optimal range 6.5–8.5). It grows well on GYM and regular on GPHF media but not on R2A, GEO, TSA, Luedemann and PYGV media. It degrades starch but not tyrosine, xanthine, casein, hypoxanthine. The following enzymatic activities according to API ZYM strips are present: alkaline phosphatase, esterase lipase, leucine arylamidase. Catalase positive but oxidase negative. Hydrolisis of aesculin and gelatine. The polar lipids profile consists in diphosphatidylglycerol, phosphatidylglycerol, phosphatidylethanolamine, phosphatidylcholine, phosphatidy linositol and unidentified glycolipid (the chromatographic mobility of which is documented in Supplementary Figure S5B). Whole-cell sugars are ribose, xylose, mannose, glucose and galactose. Meso-diaminopimelic acid is present in the cell-wall. MK-9(H4) is the predominant menaquinone, but MK-9(H2), MK-9(H0) and MK-8(H4) are present as minor components. The genome size is 5.3 Mbp. The genomic G+C content is 73.9% (Ivanova et al., 2010). The properties are as given in the species description by Montero-Calasanz et al. (2014) with the following modification. The genomic G+C content is 74.6%. The genome size is 4.8 Mbp. The accession number for the whole genome sequence of the type strain DSM 44209T is FOIE00000000. The properties are as given in the species description by Hezbri et al. (2016a) with the following modification. The genomic G+C content is 75.6%. The genome size is 4.4 Mbp. The accession number for the whole genome sequence of the type strain DSM 46839T is FZOO00000000. The properties are as given in the species description by Zhang et al. (2011) with the following emendation. It grows well on GYM, TSA and R2A media but not on GEO, Luedemann, PYGV and GPHF media. In addition to diphosphatidylglycerol, phosphatidylethanolamine, phosphatidylinositol and two unidentified phospholipids, the polar lipids pattern consists in phosphatidylglycerol, phosphatidylcholine and an unidentified glycolipid (the chromatographic mobility of which is documented in Supplementary Figure S5C). The whole-cell sugars are ribose and glucose. Oxidase and catalase positive. Aesculin hydrolysis present. MK-9(H4) is the predominant menaquinone. MK-9(H0) as listed by Zhang et al. (2011) is absent. The genomic G+C content is 74.0%. The genome size is 5.0 Mbp. The accession number for the whole genome sequence of strain DSM 45317T is FOSW00000000. The properties are as given in the species description by Hezbri et al. (2015a) with the following modification. The genomic G+C content is 74.0%. The genome size is 5.5 Mbp. The accession number for the whole genome sequence of the type strain DSM 46844T is OBDO00000000. The properties are as given in the species description by Montero-Calasanz et al. (2013c) with the following modification. The genomic G+C content is 75.6%. The genome size is 4.9 Mbp. The accession number for the whole genome sequence of the type strain DSM 45423T is FZOH00000000. The properties are as given in the species description by Montero-Calasanz et al. (2013f) with the following modification. The genomic G+C content is 74.6%. The genome size is 5.2 Mbp. The accession number for the whole genome sequence of the type strain DSM 45419T is FNHE00000000. The properties are as given in the species description by Montero-Calasanz et al. (2013d) with the following modification. The genomic G+C content is 75.7%. The genome size is 4.8 Mbp. The accession number for the whole genome sequences of the type strain DSM 45421T is FMZF00000000. MCM-C, W-JL, and MG designed the study. MCM-C, D-FZ, AY, MR, and PS performed experiments. JM-K and MG performed bioinformatics analysis. MG, TW, and NK sequenced genomes. MCM-C, PS, and MG wrote the manuscript. All authors read and approved the manuscript. MCM-C was the recipient of a DSMZ postdoctoral fellowship 2013–2015. The work conducted by the Joint Genome Institute, a United States Department of Energy Office of Science User Facility, is supported under Contract No. DE-AC02-05CH11231. W-JL was supported by Guangdong Province Higher Vocational Colleges and Schools Pearl River Scholar Funded Scheme (2014). The authors would like to gratefully acknowledge the help of Brian J. Tindall for his guidance in the chemotaxonomic analyses and Cathrin Spröer and Bettina Sträubler (all at DSMZ, Braunschweig) for preliminary DNA:DNA hybridization analysis. Ahrens, R., and Moll, G. (1970). Ein neues knospendes bakterium aus der ostsee. Arch. Mikrobiol. 70, 243–265. Breiman, L. (2001). Random forests. Mach. Learn. 45, 5–32. Collins, M. D. (1985). “Analysis of isoprenoid quinones,” in Methods in Microbiology, Vol. 18, ed. G. Gottschalk (London: Academic Press), 329–366. Gregersen, T. (1978). Rapid method for distinction of gram-negative from positive bacteria. Appl. Microbiol. Biotechnol. 5, 123–127. Hennig, W. (1965). Phylogenetic systematics. Annu. Rev. Ecol. Syst. 10, 97–116. Huntemann, M., Ivanova, N. N., Mavromatis, K., Tripp, H. J., Paez-Espino, D., Palaniappan, K., et al. (2015). The standard operating procedure of the DOE-JGI microbial genome annotation pipeline (MGAP v.4). Stand. Genomic Sci. 10:86. Kroppenstedt, R. M. (1982). Separation of bacterial menaquinones by HPLC using reverse phase (RP18) and a silver loaded ion exchanger as stationary phases. J. Liq. Chromatogr. 5, 2359–2387. Kroppenstedt, R. M., and Goodfellow, M. (2006). “The family Thermomonosporaceae: Actinocorallia, Actinomadura, Spirillispora and Thermomonospora,” in The Prokaryotes, Archaea and Bacteria: Firmicutes, Actinomycetes, 3rd Edn, Vol. 3, eds M. Dworkin, S. Falkow, K. H. Schleifer, and E. Stackebrandt (New York, NY: Springer), 682–724. Lechevalier, M. P., and Lechevalier, H. A. (1970). Chemical composition as a criterion in the classification of aerobic actinomycetes. Int. J. Syst. Bacteriol. 20, 435–443. Luedemann, G. M. (1968). Geodermatophilus, a new genus of the Dermatophilaceae (Actinomycetales). J. Bacteriol. 96, 1848–1858. Mevs, U., Stackebrandt, E., Schumann, P., Gallikowski, C. A., and Hirsch, P. (2000). Modestobacter multiseptatus gen. nov., sp. nov., a budding actinomycete from soils of the Asgard Range (Transantarctic Mountains). Int. J. Syst. Evol. Microbiol. 50, 337–346. Minni, D. E., Odonnell, T., Goodfellow, M., Alderson, G., Athalye, M., Schaal, A., et al. (1984). An integrated procedure for the extraction of bacterial isoprenoid quinones and polar lipids. J. Microbiol. Methods 2, 233–241. Montero-Calasanz, M. C., Hezbri, K., Göker, M., Sghaier, H., Rohde, M., Spröer, C., et al. (2015). Description of gamma-radiation-resistant Geodermatophilus dictyosporus sp. nov., to accommodate the not validly named Geodermatophilus obscurus subsp. dictyosporus (Luedemann, 1968). Extremophiles 19, 77–85. Normand, P. (2006). Geodermatophilaceae fam. nov., a formal description. Int. J. Syst. Evol. Microbiol. 56, 2277–2278. Normand, P., and Benson, D. R. (2012). “Genus I. Geodermatophilus Luedemann, 1968. 1994,” in Bergey’s Manual of Systematic Bacteriology: The Actinobacteria Part 1, 2nd Edn, Vol. 5, eds M. Goodfellow, P. Kämpfer, H. J. Busse, M. E. Trujillo, K. I. Suzuki, W. Ludwig, et al. (New York, NY: Springer), 528–530. Normand, P., Orso, S., Cournoyer, B., Jeannin, P., Chapelon, C., Dawson, J., et al. (1996). Molecular phylogeny of the genus Frankia and related genera and emendation of the family Frankiaceae. Int. J. Syst. Bacteriol. 46, 1–9. Parte, A. C. (2014). LPSN – list of prokaryotic names with standing in nomenclature. Nucleic Acids Res. 42, D613–D616. Pelczar, M. J. Jr. (ed.). (1957). Manual of Microbiological Methods. New York, NY: McGraw-Hill Book Company. Rainey, F. A., Ward-Rainey, N., Kroppenstedt, R. M., and Stackebrandt, E. (1996). The genus Nocardiopsis represents a phylogenetically coherent taxon and a distinct actinomycete lineage: proposal of Nocardiopsiaceae fam. nov. Int. J. Syst. Bacteriol. 46, 28–96. Sasser, M. (1990). Identification of bacteria by gas chromatography of cellular fatty acids. USFCC Newsl. 20:16. Siddall, M. E., and Whiting, M. F. (1999). Long-branch abstractions. Cladistics 15, 9–24. Skerman, V. B. D., McGowan, V., and Sneath, P. H. A. (eds). (1980). 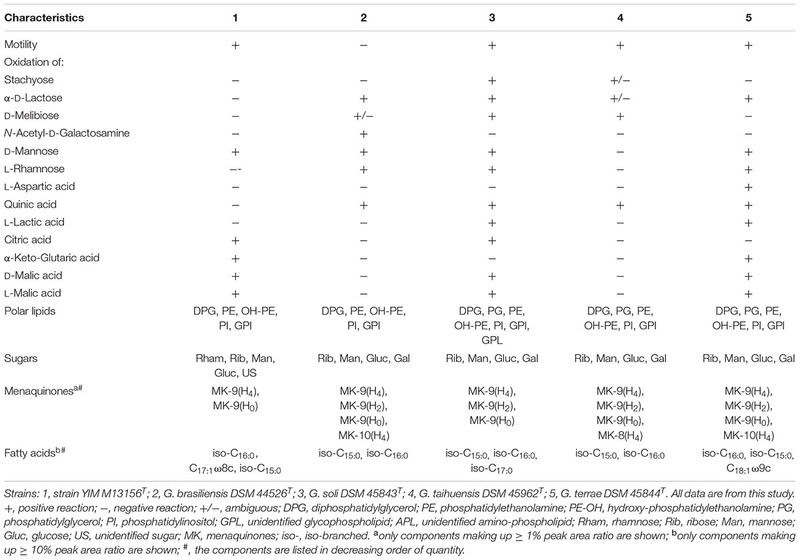 Approved Lists of Bacterial Names (Amended). Washington, DC: ASM Press. Stackebrandt, E., Rainey, F. A., and Ward-Rainey, N. L. (1997). Proposal for a new hierarchic classification system, Actinobacteria classis nov. Int. J. Syst. Bacteriol. 47, 479–491. Staneck, J. L., and Roberts, G. D. (1974). Simplified approach to identification of aerobic actinomycetes by thin-layer chromatography. Appl. Microbiol. 28, 226–231. Suzuki, R., and Shimodaira, H. (2006). Pvclust: an R package for assessing the uncertainty in hierarchical clustering. Bioinformatics 22, 1540–1542. Tamura, T., Hayakawa, M., and Hatano, K. (1998). A new genus of the order Actinomycetales, Cryptosporangium gen. nov., with descriptions of Cryptosporangium arvum sp. nov. and Cryptosporangium japonicum sp. nov. Int. J. Syst. Bacteriol. 48, 995–1005. Urzì, C., La Cono, V., and Stackebrandt, E. (2004). Design and application of two oligonucleotide probes for the identification of Geodermatophilaceae strains using fluorescence in situ hybridization (FISH). Environ. Microbiol. 6, 678–685. Vandamme, P., Pot, B., Gillis, M., de Vos, P., Kersters, K., and Swings, J. (1996). Polyphasic taxonomy, a consensus approach to bacterial systematics. Microbiol. Rev .60, 407–438. Copyright © 2017 Montero-Calasanz, Meier-Kolthoff, Zhang, Yaramis, Rohde, Woyke, Kyrpides, Schumann, Li and Göker. This is an open-access article distributed under the terms of the Creative Commons Attribution License (CC BY). The use, distribution or reproduction in other forums is permitted, provided the original author(s) or licensor are credited and that the original publication in this journal is cited, in accordance with accepted academic practice. No use, distribution or reproduction is permitted which does not comply with these terms.